The Reporter, of course, is owned and published by Amare Aregawi who once was a TPLF official. The news paper is known for its close relationship with the clique currently in power in Ethiopia. “The panel of elders” it referred to is a group of Ethiopians which purportedly secured the release of CUDP (Kinijit) leaders from TPLF dungeon after they were convicted by Melles Zenawi’s court and applied for clemency. However, given history of the mediator(s) and past TPLF behavior during negotiations /mediations, there is a need for acute awareness of the risks involved in moving into mediation with the TPLF particularly with the good professor and his team as mediator(s) for two reasons. First, it has often been said that one major factor determining the success of third party mediation efforts is the perceived impartiality of the mediator(s). One of the Standards of Mediation Practice is that “A mediator shall avoid conduct that gives the appearance of partiality towards one of the parties.” As you will see below, the good professor has already failed to meet this standard of mediation practice and has shown partiality toward TPLF. Second, if the best predictor of future behavior is past behavior, then mediation with TPLF will get no where but will harm the opposition parties and benefit TPLF. In the seventeen years it has been ruling the Ethiopian Empire, the TPLF regime has initiated or held negotiations with various internal opposition groups and liberation fronts. All of these efforts have two things in common. First, none of them came to fruition. Secondly, they all resulted in splitting and weakening the opposition parties and presenting TPLF to the international community as a regime interested in peaceful resolution of conflicts. In all these efforts, mediation was used as a tactic by TPLF without any genuine desire at all to settle the century old political problems of the empire and only to attempt to split the opposition into 'hawks' and 'doves' and force the 'doves' faction of the splintered opposition to join one of TPLF’s PDOs or join TPLF parliament. As you will see shortly, this has happened or has been attempted in almost every mediation/negotiation between the TPLF and its oppositions. So, who is Prof. Ephrem Isaac? Imagine this. 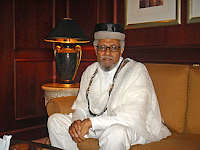 In this interview he proudly talks about “his history” - Abyssinian history. He reminisces about Minilik’s, Yohannes’ and Tekla-haymaanot’s culture of reconciliation with each other but no mention of their crimes against the Oromo and other Southern peoples in the empire. No mention of Oromo peace loving and reconciliation traditions either. Regardless of whether his mother is Oromo or not, Prof. Ephrem’s bias against the Oromo and for the Habasha is in the open. Even with in the Habasha society, I doubt Prof. Ephrem can be considered an unbiased mediator. It is one thing to move into mediations with the help of well-meaning and impartial intermediaries and quite another getting involved in one mediated by a third party like Prof. Ephrem Isaac who really is not a mediator but a messenger for one side. In 1997, TPLF engaged ARDUF in negotiations. The negotiation resulted in splitting ARDUF. The “hawks” continued the struggle, while the “doves” led by Muhyadin Maftah Kedir (The Deputy Secretary General of ARDUF who was arrested in Djibouti where he was undergoing medical treatment and spent one year in TPLF prison.) signed peace agreement with EPRDF. The peace agreement died after TPLF tried to force this faction of ARDUF to merge with the pro-TPLF Afar People’s Democratic Organization (APDO). After many failed attempts at splitting the OLF, TPLF succeeded in 2001. According to observers of Oromo politics, the 2001 OLF split traces its roots back to a letter signed by the ‘doves’ group of the OLF leadership in early 1998 accepting TPLF pre-conditions in an effort jump start negotiations. The two preconditions TPLF always insisted, and continues to insist, upon are acceptance of the TPLF constitution and renouncing armed struggle. When the “doves” signed the pre-conditions, the “hawks” opposed it and convened OLF general Assembly in “Southern Oromia.” But by then the damage has already been done. The “hawks” vs. “doves” dichotomy has already set in. It is said that OLF never recovered from that division. Then, in 2000, came another olive branch to TPLF from the “doves” in the OLF leadership in the form of “Agenda for peace.” OLF’s “Agenda for Peace” became the proverbial straw that broke the camel’s back and led to its final split. Then there is Kinijit. First came the UEDP-MEDHIN (Lidetu Ayalew’s party) split from CUDP (Coalition for Unity and Democracy.) According to many observers, Lidetu was engaged in negotiations with TPLF long before the split. Eventually, Lidetu and his party joined the TPLF parliament. Obviously, mediation/negotiation is a civilized way of resolving differences. In politics mediation/negotiation can be brutal. However, that is no reason to avoid them. On the other hand, past dialogues and negotiations with TPLF achieved nothing and undermined the oppositions’ organizational unity. Conversely, they strengthened TPLF politically and diplomatically. If you are going to engage in negotiations/mediations with TPLF, obviously; (a) The need for unbiased and impartial mediator(s) is paramount; (b) the risk of exposing your group to the danger of internal splits should be upper most in your minds. It is now a public secret that Coalition for Unity and democracy party (CUDP, a.k.a. Kinijit) is coming apart at the seams. Just when it thought it has left its legal saga behind, it is now facing a fractured leadership and a divided constituency both inside and outside the country. After simmering under the surface for a long time, the conflict with in the CUDP leadership erupted soon after their release from TPLF prison. North America is now one of the battle grounds for the political/propaganda and legal fights between the Hailu Shawel group and the Berhanu Nega group. Since their arrival in North America a couple of weeks ago, they have both been utilizing every communications media they can to win the hearts and minds of the Habasha (Abyssinian) Diaspora. The first bullet in the legal combat, however, is fired in Toronto, Canada. Kinijit Ethiopian Cultural and Relief Organization in Toronto has filed a lawsuit against Kinijit Canada council, Kinijit for Human Rights and democracy and Kinijit Waterloo for “infringing the plaintiff’s rights in the Kinijit design trade-mark.” From the little information this blogger has, it looks like the plaintiff is on Hailu Shawel’s side while the defendants are on the side of Berhanu Nega and Co. It is to be recalled that the Asmara Group of OLF had filed a similar lawsuit against TA-OLF. The allegations in Kinijit lawsuit are almost exactly the same as that of the Asmara group of OLF’s against TA-OLF in a Minnesota court. Both lawsuits allege the defendants (a) Infringed the plaintiff’s exclusive rights to use the organizations’ logo, trade-mark, etc …; (b) Passed their services off as that of the plaintiff’s and in the process confused the public; (c) Seriously hampered the plaintiff’s ability to raise funds. Both plaintiffs plead with the courts to (a) Grant them permanent restraining orders against the defendants; (b) Award them compensatory damages; (c) Award them their legal fees arising from these disputes and other costs. It looks like these two plaintiffs have taken politics for business, and political organizations for business firms whose primary raison d'etre is NOT political education and political struggle but fund raising and amassing money. What is the world coming to? This blogger has no sympathy for CUDP, but don't they have better things to do rather than dragging each other in the courts? Don't they see that this is a dream come true for Melles and Co.? Read Kinijit Ethiopian Cultural and Relief Organization in Toronto’s statement of claim HERE. You may have to download the document as Kinijit seems to have removed it from their web site. Many thanks to those who informed this blogger of the removal. If you think you have heard the last of the OLF legal saga, then think again. The Asmara Group of OLF has re-filed its lawsuit against TA-OLF in a Minnesota court. It is to be recalled that the same lawsuit was “dismissed without prejudice” by a Minnesota court in mid August of this year. According to legal experts, a complainant whose complaint is dismissed without prejudice has the option of re-filing the same complaint or dropping it altogether. It looks like the Asmara Group of OLF has opted for the former. That this is the case has been confirmed by this blogger’s contacts in both the Asmara Group- and TA-OLF. In an effort to help his readers understand the reasoning that went in to conceiving, initiating and defending this case, this blogger has drafted and sent the following questions to both contacts. You both have members all over the USA. If you win this case in Minnesota, does that mean ONLY your group can operate as OLF just in MN or all over the USA? As you know, other parts of the world have their own separate court systems. Whatever the judge rules in MN, it is almost certain that Europe, Canada, Asia, Africa, etc … will not enforce it. To the plaintiffs, I ask: Do you plan to file complaints in other parts of the world as well? To the defendants, I ask: would you defend such cases in other parts of the world as well? How much have you spent so far on lawyers and where did that money come from? Had you not been engaged in this court case, what would you have used the financial and other resources you are currently expending on this lawsuit for? Stay tuned for their answers. That is, if they respond. Do you have any questions, or advice for one or both of the groups? If you do, please have your say.